1. What is inspiration? Does it really exist? 2. What is the relationship between inspiration and art? Is inspiration necessary in theatre, film, or any kind of art? Can art exist without it? 3. What is the way or road toward inspiration? 4. What kind of effect does inspiration have on life? A panel of Japanese, Russian, Korean & American artists, philosophers and teachers was joined by approximately 150 people from theatres and schools around Japan to contemplate and discuss these questions. TV documentary director, and director of the documentary film "Song of the Island - Thousands of Islands"
Mr. Itoh was born in Matsumoto city, Nagano prefecture in 1967. 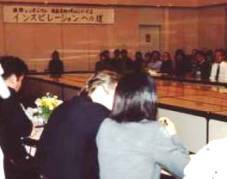 After he studied Urban Sociology centered on field works in the Department of Sociological Studies at Rikkyo University, he started to work as an announcer at NHK (the Japanese national television and radio broadcast company) in 1991. He also directed documentary programs and covered news when he encountered "To Live in Aga" by Makoto Satou, which convinced him of the higher possibilities of documentary films. 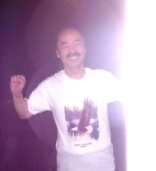 He left NHK in 1997, and joined a program production company, Telecom Staff. Since then, he has directed many documentary TV programs. "Song of the Island - Thousands of Islands"
Mr. Kaneshita was born in Hokkaido in 1964. He graduated from the Nippon Engineering College, and the actor’s training school of Seinenza Theater Company. He established “Theater Production Company The Gazira” in 1987. Its first performance “Once Upon A Time In Kyoto” (Jels Hall in Tokyo) won the Jels Circuit Grand Prize. He has established himself as a playwright and director since that time. Mr. Kaneshita won the Rookie of the Year award at the 42nd Minister of Education’s Art Encouragement Prize for “Tatsuya – Side of the Beloved” in 1992, and the Individual Prize at the 32nd Kinokuniya Theatre Awards for “POW – Prisoner of War” and “Samuhana”, which he wrote and directed himself in 1997. He also won the Grand Prize and the Best Director Prize at the 5th Yomiuri Theatre Awards for his four plays “POW – Prisoner of War”, “In Front of the Greenhouse” (by Kunio Kishida), “Release on Parole” (by Akira Yoshimura), and “The Bottom” (by Masataka Matsuda). 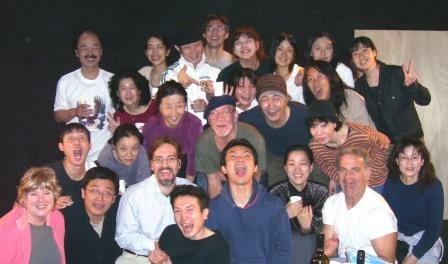 Mr. Kaneshita creates theater works that always look at Japan while expanding the breadth of his career in many fields. Mr. Kamata was born in Tokushima Prefecture in 1951. He graduated from Kokugakuin University, Department of Literature, Philosophy Section, and completed a Doctoral course at the same university with a degree in Shintoism. He won Rookie of the Year at the Shintoism and Religion Society Research Encouragement Awards for “Legend of the Water God.” He was awarded with a Joint Research Prize in 1990 by the Japan Child Care Society Research Encouragement Awards. 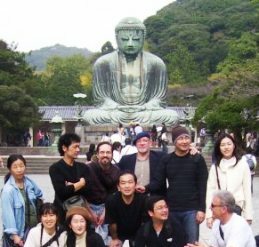 He was a joint research member and visiting assistant professor at the International and Japanese Culture Research Center from 1989 to 2000. 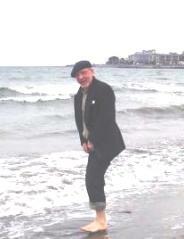 He served as Celtic studies visiting researcher at Dublin (Ireland) University in 1995. 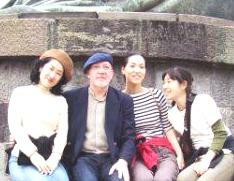 Mr. Kamata formed a music unit called “Unit of Origin Soul of Sound” in May 1998, and started his career as a stone-pipe player. He appeared as a “Shinto songwriter”, and released his first CD in December 1998, and composed 200 songs that year. He performs live at venues around Japan. 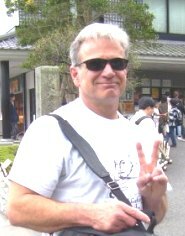 He obtained his PhD (Literature) at the University of Tsukuba with “Comparative Religious Research on Spirit of the Words” in March 2001. 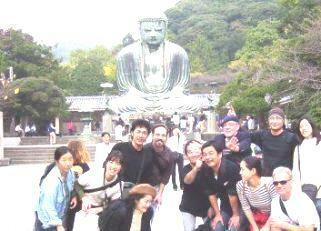 He is now a professor at the Kyoto University of Art and Design, and Chief Director of NPO Tokyo College of Liberty. 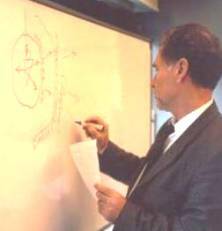 His specialties are philosophy of religion, folklore, and history of Japanese thought. Ms. Toriyama graduated from the Department of Education at Kagawa University. Throughout her 30 year career as a public elementary school teacher in Tokyo, she developed progressive classes to stimulate the minds and bodies of children while studying the works of predecessors in related fields. She retired in 1994, and started to give workshops and lectures under the name of “Kenji’s School” speaking out on how to “connect our lives.” She searched for a system that a person could use to live their life as a whole at home and at school. She started to establish a new school with teachers and parents who were in sympathy with her ideas. Tokyo Kenji’s School started in April 2001, and she was in charge of the 6th grade, and the principal of the school. She also completed a one year special training course in Steiner Education for Japanese in Nuremburg, Germany in 2004. Ms. Toriyama’s works include: “Making by Being Made”, “Kenji’s School”, and “Knowing Through the Body, the Strength to Live” (books); and “Natural Agriculture” and “To Hand Down the Mountains for Our Children” (documentary films). The American Panelists were Paul Layer, Yoko Layer, Corinne Bogan and Robert Bertocchini. Tokyo Novyi Repertory Theatre is beginning its 3rd years, and we were privileged to see 3 rehearsals (The Cherry Orchard and The Seagull), and 4 performances (Three Sisters, Uncle Vanya, At The Bottom and The Love Suicides at Sonezaki). 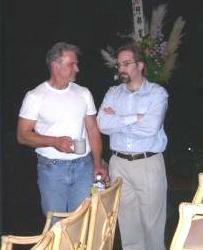 Robert & Paul are talking about SOMETHING? in the theatre. 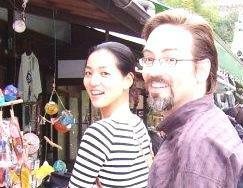 Japanese translator( Russian and Japanese)- Mr.Tosaka. 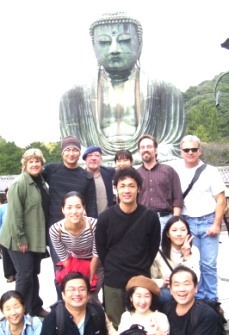 We went to Kamakura with Leonid and some of Japanese actors. 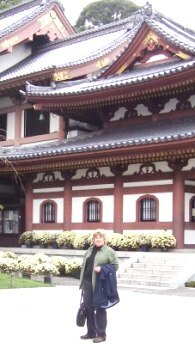 Corinne in front of Hase temple. 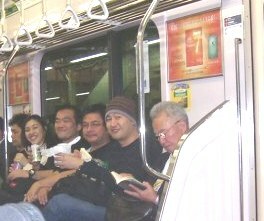 Japanese actors on the train. Corinne, Paul, Robert on the train.